Like other keyhole limpets, this species possesses a conical shell with a dorsal hole in it to enable the release of oxygen-depleted water from the gills, nitrogenous waste and, seasonally, gametes during the reproductive phase. 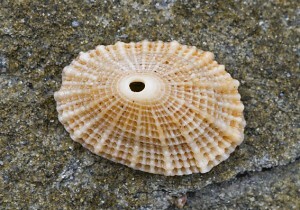 Jukes’ Keyhole Limpet is one of the most common species along the northern coast of Australia and mostly associated with subtidal rocky reefs and rock platforms. As seen in the image, it is strikingly patterned with both concentric and radiating ribs. Indigenous: Widely distributed on Australian coastline.